Totally GNARLY! I have never seen one like this! This is a '78?! Whoa. Yep, the rarest Patterson frame ever made. Very nice. a work of art. love the dropouts. cool frame! crazy, the back triangle looks bigger than the front. I simply cannot believe I'm seeing these pictures; I had one of those back in 1979+. My pop bought me the frame as a Christmas present, and we built it up from there. It eventually ended up with Mongoose forks, a blue Sugino Super Maxy crankset, Redline neck, Cook bros. bars and a blue fluted aluminum seatpost. I eventually replaced the ball-bearing/cage race type BB with a sealed unit; I want to say it was a Phil but I can't remember. It had good rims (blue) of some decent brand with Shimano (I think) hubs. 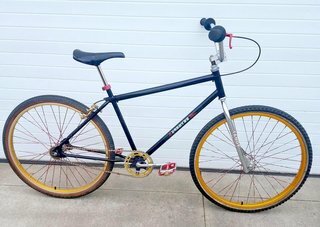 All my buddies thought I was crazy (and lame) to run a front brake on it but they piped-down once they rode it. Front brakes in school everywhere after that. I remember we had to hunt for a rear spindle long enough to cover that colossal rear-dropout spread. The sad part is, I can't remember what the hell happened to it! I think I gave it to some neighbor kid when I was in high school. Hmm. Oh yes, and gearing was 42 - 14. Pretty tall for BMX back then. Won a few more races with that extra leg. ^^^ Nah, check that. I think it was 44 -14 and most other guys were running 44 - 16. Let the Good Times Roll!! our Team formed by the McCully Bicycle & Sporting Goods out in the Pacific (Honolulu Hawaii) Team riders were issued these Sentry Frames by Patterson Racing, we even got to Ride with Brent and I think it was his brother Brian when they came down for the Hawaii 50th State Championship races. awe some bike!! brings back a Lot of Good and Fun memories!! also the cherished wins!! Totally whatever they Wanted it to be..cant believe you guys aint pointed out those rear "girder dropouts" that is so far ahead of the game for 78...dunno what the boys were smokin..but this is one smokin frame..stunning..Kev.